Schweizer is president of the 35-mile-long Catlin Canal, which irrigates about 18,000 acres of farms. He’s hoping that the trial run of something called the Arkansas Valley Super Ditch will save the basin’s remaining communities and farms. 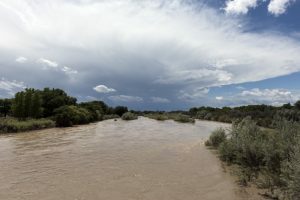 The initiative is not actually a big ditch, but rather a scheme that allows six of the valley’s irrigation canals to pool their water rights and temporarily lease them to cities. Starting in March, five Catlin irrigators “leased” a total of 500 acre-feet of water, which would normally supply their fields, to nearby Fowler and the cities of Fountain and Security, 80 miles away. Under the agreement, communities can use the farm water to supply homes and recharge wells for up to three years out of every decade. During those years, the irrigators will have to fallow, or rest, some fields, yet will still be able to earn money from the water itself and farm the rest of their land. Statewide, cities have acquired at least 191,000 acre-feet of agricultural water, eliminating farming and ranching on millions of acres. Water managers estimate Colorado could lose up to 700,000 more acres by 2050. Like Schweizer, officials consider water leasing, also called lease-fallowing or rotational fallowing, a promising way to slow that loss while satisfying urban thirst, particularly since alternatives like new dams and other big water-development projects face regulatory hurdles and environmentalist opposition. Colorado’s draft water plan suggests the state could meet up to 50,000 acre-feet of its future water needs — and avoid more buy-and-dry — through such water-sharing deals.